In this program Andrews discusses: "language writing," the pitfalls of having "poetry" as an institutional designation and co-editing L=A=N=G=U=A=G=E magazine in the '70s. He also reads from his book I Don't Have Any Paper so Shut Up! Andrews reads from Give 'Em Enough Rope, Lip Service and War and Peace (ed. Judith Goldman and Leslie Scalapino). He describes his modular writing process, his collaborations with musicians, dancers & other poets, and Lip Service's interrogation of gender socialization. Baby (7:14): MP3 - Parts A & B of a 3 part poem, from Fall 2001. Live Choreography (7:59): MP3 - composed/edited live, Spring 2001, at Sally Silvers concert, Construction Company, NYC, in 17 sections. Dang Me (16:47): MP3 - 5 prose poems, 2000, several in Shiny & in Best American Poetry 2004; dedicated to Kevin Davies. Snow Pony (4:58): MP3 - performance text for a duo with Sally Silvers imporvised movement; published in Sulfur 45-46 (Spring 2000). Dear Easy To Be With (from the Millenium Project) (3:58): MP3 - the entire project published online on Craig Dworkin's Eclipse site; these 2 (of a thousand parts) published in Aerial, the Bruce Andrews issue. Primum Mobile 10 (4:17): MP3 - end parts of the 100th section of Lip Service (Coach House Press, Toronto), from 'And real time is dead' to the end ['let's start all over stars']. Note: Roberta Tejada's introduction was not recorded. First pages of "I Guess Work The Time Up" (7:09): MP3 - pp.7-10 in Enough Rope (Sun & Moon Press, 1987). You Made This World, We Didn't (5:10): MP3 - Last of the 100 sections of I Don't Have Any Paper So Shut Up (or, Social Romanticism) (Sun & Moon Press 1992). Index (4:37): MP3 - the Table of Contents of I Don't Have Any Paper So Shut Up (or, Social Romanticism) (Sun & Moon Press 1992). Did You Really? (10:43): MP3 - from the journal Big Allis #2, reprinted in Designated Heartbeat, pp.34-36. Time Expansion (3:12): MP3 - text to musical score for Sally Silvers and Dancers choreographic concert, 1992; reprinted in Designated Heartbeat, pp.34-36. Devo Habit (2:42): MP3 - reprinted in Designated Heartbeat, pp.38-40. Valentines (3:14): MP3 - Designated Heartbeat, pp.60-61. Primum Mobile 9 (10:38): MP3 - the 99th of 100 sections of Lip Service (Coach House Press, 2001), pp.373-380. Primum Mobile 10 (9:41): MP3 - the 100th of 100 sections of Lip Service (Coach House Press, 2001), pp.373-380. Are the First (4:04): MP3 - later published in Wobbling (Roof Books, 1980), pp.46-48. 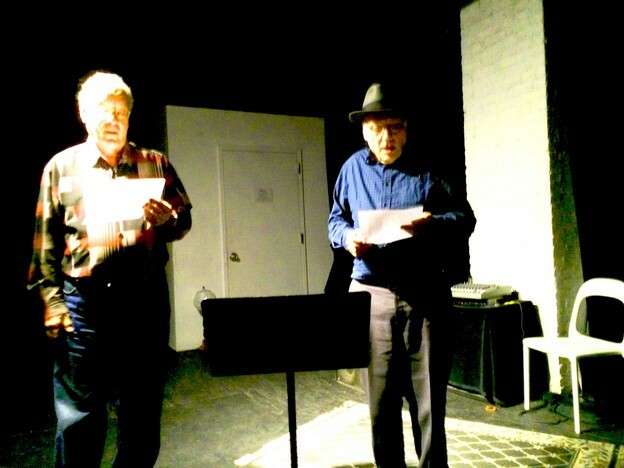 April 15, 2009: "Bruce Andrews: Reading and Interview on 'Destination Out,' hosted by Tom Orange, 2008"
These sound recordings are being made available for noncommercial and educational use only. All rights to this recorded material belong to the author. © 2018 Bruce Andrews. Used with permission of Bruce Andrews. Distributed by PennSound.